Triskell Seafood Ltd was founded in 1999 by Marie-Aude Danguy, a native of Brittany on the west coast of France. 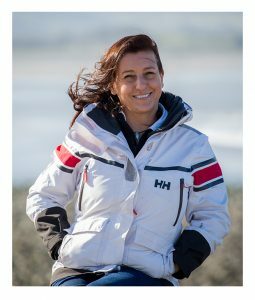 Coming to Ireland as a student at Sligo IT in the late ‘80s, Marie-Aude stayed on and learnt her trade working in shellfish farms throughout the northwest, her passion for shellfish apparent from the very start. In business now for almost 20 years, Triskell Seafood Ltd was originally set up to sell oysters and clams to France and has since expanded its activity right across Europe. The company today covers all aspects of the Aquaculture Industry from trading of live shellfish to the supply of specialised aquaculture equipment and accessories through our sister company Triskell Pro Ltd. We also facilitate the supply of seed and are expert at advising new and existing businesses on set-up and best practices. Our personalised service includes on-site visits in order to ensure optimum results. Marie-Aude recognizes the importance and role that her suppliers and customers have in making the business the success it has become. Triskell Seafood Ltd and Triskell Pro Ltd are synonymous with excellence in service and reliability. With our knowledge and understanding of the Aquaculture Market, combined with a real expertise in logistics and export, we will deliver your order on time and according to your specific requirements. Hailing from County Mayo is Brona Galvin, who is taking over as Office Manager at Triskell Seafood. Brona has worked for many years in administration and accounts in companies across the county and brings a wealth of experience with her. She is a keen golfer and member of Strandhill Golf Club, and when not out on the course enjoys walking the many beautiful tracks and byways of Sligo. Working beside her is Katarina Tothova. From Slovakia originally, Katarina has made Sligo her home for many years now and has been working with Triskell Seafood for the last 4 years. With a qualification in book-keeping she is primarily involved in financial control for the business. A keep fit enthusiast, Katarina is particularly interested in gym and dance and is always happy to stretch her muscles moving pallets in the warehouse! Completing the back office team is Niamh Doyle. Niamh originally trained as an archaeologist and moved west 10 years ago – attracted here by the sea, the hills and the fabulous archaeology. She has worked in a range of office roles and nowadays confines her digging to her garden, she is an enthusiastic student of french! Emmanuel Rene, a native of La Rochelle in France, is a sales executive at Triskell Seafood. He discovered Ireland in 2003 during a linguistic exchange and has never left. Surfing being his passion, it didn’t take him long to find his way to the Atlantic where he settled in Sligo in the north west of the country. From a young age he has been involved with shellfish, having spent many summers helping his brother in law on the family oyster farm in France. These days he shares that heritage with his children; walking the wild Atlantic coast and combing the shore for wild mussels and winkles for the table. Originally from Yerseke in The Netherlands, Francis Kater comes to Triskell Seafood from the wilds of Shetland in the northernmost tip of Scotland where he worked in a number of mussel-growing and shell-fish processing enterprises. A man of many interests and able to speak a number of languages, Francis’ decision to return to the West of Ireland happily brought him to our door where he will now be taking care of our warehouse duties.